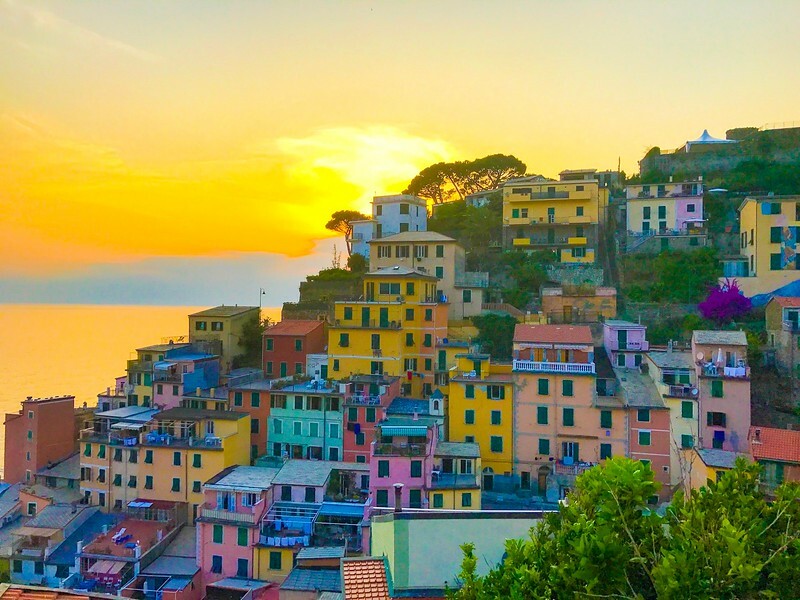 Hiking in Cinque Terre can be a dream – medieval fishing villages, stunning far-reaching views of the Italian Riviera, the opportunity to refuel with delicious just-caught fish and a glass of local wine from the vineyards you’ve just hiked past. It offers hikers a lot more than just scenery. What’s the Best Way to Hike the Cinque Terre? However, there are a lot of things to figure out before you hike the Cinque Terre. Perhaps one of the most important things is that you shouldn’t just limit yourself to Cinque Terre. You’ll find incredible hiking trails all along the Italian Riviera. On our self-guided hiking tour Hiking the Italian Riviera: Cinque Terre and Beyond we give you the best of both worlds. You’ll hike in the world famous (and often crowded) Cinque Terre and also explore a bit further along the coast. 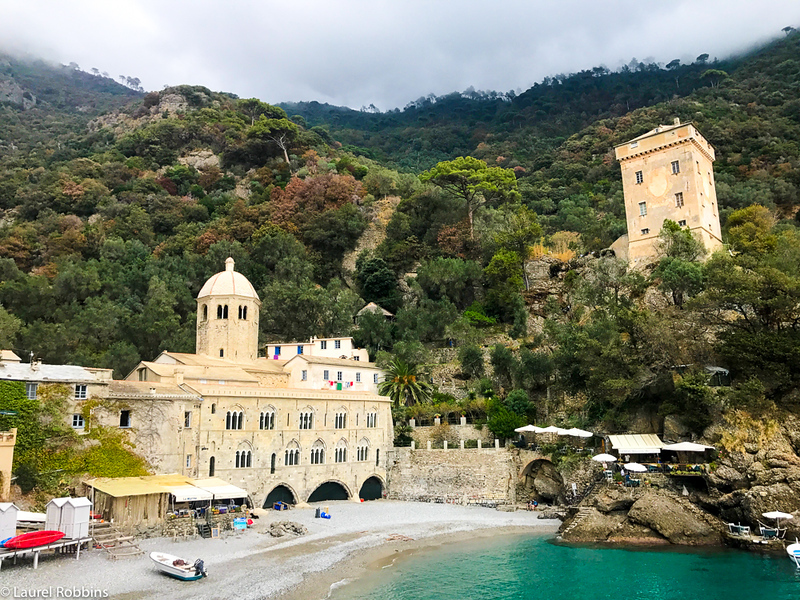 You’ll avoid the crowds and see stunning parts of the Italian Riviera that many travelers miss out on. We provide a detailed itinerary with step-by-step instructions for each hike, but you’re free to choose which one you do on which day and whether to choose the easier or more difficult option – when available. It’s your vacation. You choose what works for you. Cinque Terre is famously known for its five namesake villages, Riomaggiore, Manarola, Corniglia, Vernazza and Monterosso al Mare. Cinque Terre translates as five lands in English. But it’s also a national park – Italy’s first! It’s also Italy’s smallest with an area of just 38.60 km2 (14.90 sq mi). It’s a delicate balance of people, 5000 people live there, plus masses of tourists and the environment. Also, it’s a UNESCO World Heritage Site. All the villages are close enough that it’s good to choose one base. 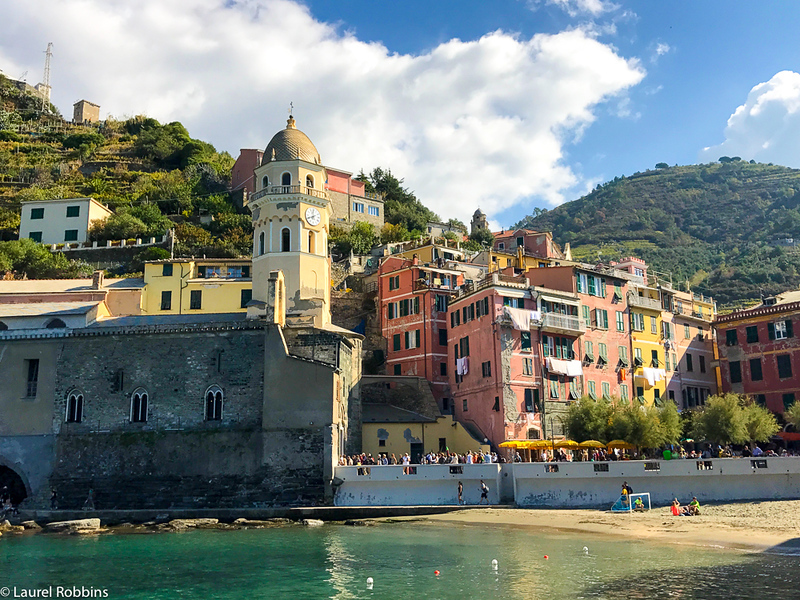 If you want to stay directly in the Cinque Terre, check out this article which provides accommodation recommendations for each village. On our tour travelers stay at a 4-star wellness hotel in Levanto. It’s close enough to the action and still lively but not as touristy as the Cinque Terre villages. It’s possible to hike Route 2, the Sentiero Azzuro or Blue Trail), the low route and the most popular one in ~ 5 hours IF all the trails are open. But as of late 2017, the hiking trails between Riomaggiore and Manarola and Manarola to Corniglia are still closed. If you choose the high route for these sections, it will take much longer. I wouldn’t recommend doing it in one day. 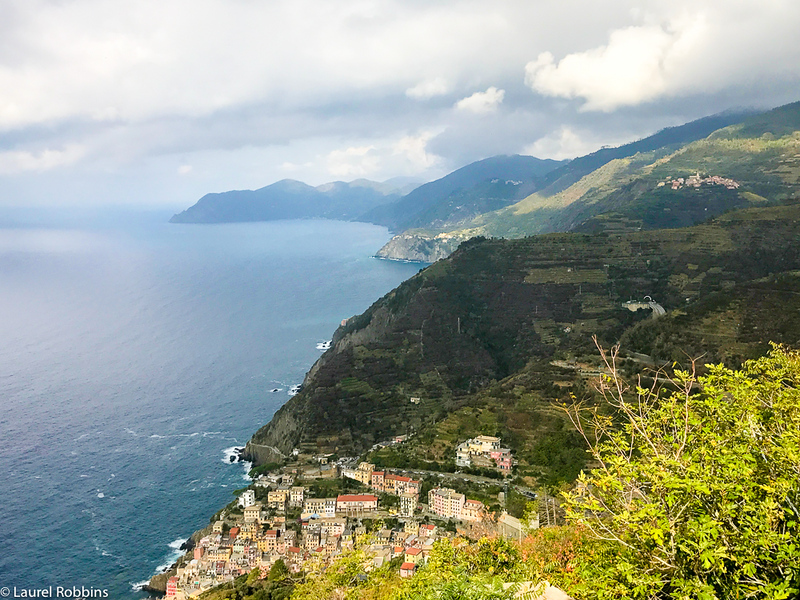 And while it’s possible to do it one day (I did the first time I hiked it), it’s so much more enjoyable to spread it out over several days and explore beyond the Cinque Terre. Our Hiking the Italian Riviera tour is six days, with five days of hiking. It’s a fantastic mix of the Cinque Terre trails and other lesser known and less busy trails with equally stunning views over the Italian Riviera. Hiking Profile: 2:30 – 3 hours, + 350 m ascent, – 350 m descent. I loved this first day of easing into hiking. After arriving by train from Milan and checking in, I was excited to see Bonassola. It’s a charming village that Ernest Hemmingway called sweet and memorable. And no it’s not one of the famed Cinque Terre villages. It’s a cute village but lacks the flair of the Cinque Terre villages. Still, it’s worth seeing. I timed it for the golden area and loved hiking with the sun on my face. You could also go for a dip in the Ligurian Sea in either Bonassola or back in Levanto. As I was there in November, I choose the warmer option of walking in the sand. It was an easy first day that eased me into the more laborious hikes to come. 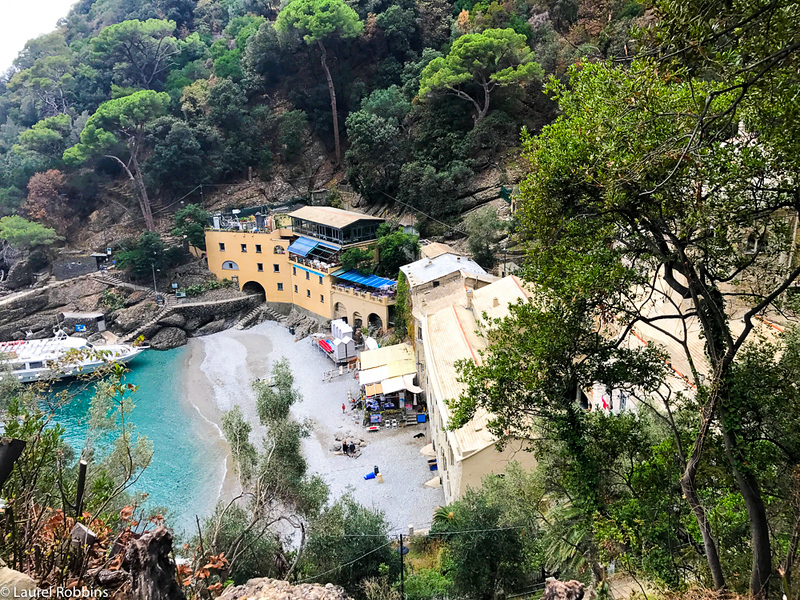 I was excited to do the hike from Levanto to Monterroso, the first of the Cinque Terre villages. I hiked up huffing and puffing. It starts with a steep path up to a Romanesque chapel that dates back to the year 1000. Then, I passed a lighthouse a bit further on with wide-spreading views makes. It would make an excellent picnic stop, but I just stopped long enough to catch my breath. Then it was time to descend to Monterroso, enjoying spectacular views of the coastline. There are lots of restaurants here if you arrive in time for lunch, but I wasn’t hungry. It also has the best beach of the five Cinque Terre villages so bring your swimsuit if you go in warmer weather. While there were a few brave souls splashing around in the Ligurian Sea, it was a bit too chilly for my liking, so I carried on. Next stop – Vernazza. It’s in this section that you need to have a hiking pass for the Cinque Terre (see below). I started climbing up again but this time among vineyards and lemon orchards. The views over Vernazza, which many consider to be the most beautiful of the Cinque Terre villages, is spectacular. I inhaled the salty sea air, and an overwhelming sense of gratitude came over me. How did I get to be so lucky to be there? And for the third time no less. Life is good. Then, it was time to descend to the bustling village of Vernazza. I walked through the maze of streets until I reached the sea and found a place to eat lunch. I made my way to the train station and headed back to Levanto for a gelato stop and walk along the beach. This day surprised me the most and was one of my two favorite hiking days. As it started in Riomaggiore, I expected the hiking trail to be crowded as the Cinque Terre hiking trails often are. Almost immediately, I discovered this wasn’t the case. My smile widened. It was going to be a great day. After hiking up a gradual but never too steep trail, I arrived at the Madonna of Monte Nero Monastery. This was one of my favorite views of the Cinque Terre because you can see three of the five villages. There are also picnic tables there, so I took a few moments to take it all in. One of my favorite things about hiking is the moments between hiking. It’s almost always a time of peace and a time when I feel grateful. Then, I was off hiking among olive groves on a relatively flat stretch until I reached Campiglia. It’s a good place to stop for lunch. 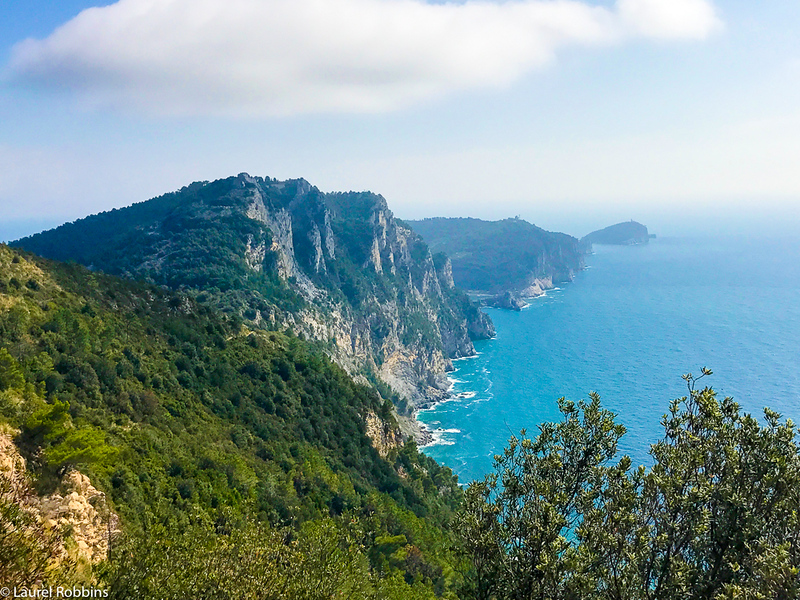 It had been a fantastic day already but little did I know that the trail through the pine forest led to what were probably my favorite views of the entire trip – rugged cliffs that were wilder than the Cinque Terre coastline and less visited. I only saw a few other hikers and one group the whole day. I loved the wild rugged coastline views seen while hiking to Portoverne. Reluctantly, I reached Portovenere, known as the bay of poets. It’s a lovely town that’s worth exploring or at least having dinner here. I returned to Levanto by catching a bus, then taking a train since unfortunately, due to the sea conditions, the boats weren’t running. However, if you have the option to return by boat do it. You’d get fantastic views of the Cinque Terre villages. I’ll admit that I was grumbling a bit about the idea of starting the day with a 1:15 hour train ride. There were so many amazing places to hike nearby. Curiosity got the best of me though. I figured if it was included in my Self-Guided Hiking the Italian Riviera itinerary it must be for a good reason. Turns out it was. This day ended up being one of my two favorite days of hiking. I started in the gorgeous town of Camogli. Once you’re there you can choose one of three options. I chose the longest one which is described below. San Fruttuoso Abbey as seen from above before hiking down to it. I started by hiking up to San Rocco, known for its church and church square. Then, I continued ascending along a shaded path until I reached a picnic area in the woods. I took a short water break but then continued on. I don’t usually stop much or take long breaks when hiking as it interrupts my state of flow. Then, I continued on but this time heading down an oak-filled ravine to the magnificent site of San Fruttuoso. It’s a stunning abbey hidden away at the edge of the sea and only reachable by foot or boat. Up until this point, I had only crossed paths with several other hikers. I now understand that the train ride deterred a lot of people – more than making up for it. You hike down the oaks forest pictured in the background until you reach San Fruttuoso Abbey which is only reachable via hiking or boat. You’ll definitely want to take some time and pay the few euros entrance fee to explore the main monastery and the 16th century watch tower located just above the monastery. There are also several places you can eat. Given its limited access, it’s not surprising that it’s not the cheapest place you can eat but I just had something small and enjoyed the views over the bay and watched one intrepid swimmer with amusement. I’m a wimp when it comes to swimming cold water which it was in November. You could also bring your own food and enjoy a picnic on the beach. Alternatively, you could delay lunch and start making your way up to Base O. There are picnic tables and it makes for a great rest stop. I stopped here briefly and chatted with a French couple who were staying in the same hotel as I was. You’ll finish your day of hiking in Portofino, a posh village. From there, you’ll continue hiking through terraced olive groves until you reach Portofino. Be warned, people in Portofino are dressed to impress. I caught a glimpse of my sweaty self wearing hiking clothes and felt like an intruder. While I didn’t dare go into any of the high end shops dressed as I was – but admittedly I probably wouldn’t have gone in anyway, I did stop for a gelato and enjoyed it while admiring the yachts. You can also visit the castle Castello Brown. If you’re still feeling energetic you can extend your hike by hiking to Santa Margherita. I took a boat for the experience but there’s also a bus which is cheaper than the boat. From Santa Margherita, I took a train back to Levanto. Hiking Time: 4:30 – 5 hours, + 550 m ascent, – 550 m descent. I took the short train ride to Vernazza. It’s always a joy to return to this gorgeous Cinque Terre village which was my final destination on a previous day of hiking. Then, I followed the path hiking through olive groves that lead to Corniglia. It’s the highest of the Cinque Terre towns. And also the smallest of the five villages. It’s also the hardest to reach – a 100 m (300 ft) climb. But, it’s so worth it! Vernazza, one of the Cinque Terre villages seen from near the sea. After I stopped for gelato break (I love gelato as you have probably noticed by now :), I carried onto Manarola descending 365 steps. Note: the coastal path (as of November 2017) was still closed due to flooding damage. If it’s still closed, we’ll provide the directions for an alternative route. You’ll definitely want to find this out first before descending the stairs – if you need to take the alternative route, it starts from the village and you won’t want to ascent the stairs that you’ve just descended. Unfortunately, I messed up and descended the stairs realizing too late that I missed the alternative route. The idea of climbing 365 steps and then continuing on hiking proved too much after gelato so I hopped on the short train ride to Manarola. One of my favorite things to do in Manarola is to watch daring teenagers jump off the rocks while enjoying a tasty gelato. I’m pretty sure there’s not an age limit as to who can do it but I’d guess the oldest person I saw doing it was in their early 20s. It’s an entertaining rest stop before continuing on. From Manarola, the regular coastal route to Riomaggiore follows Footpath #2, Via dell’Amore. As of November 2017, it was closed due to the flooding damage. You can either take a very short train ride or hike an alternative route that’s 30 minutes longer and results in an additional 180 m of elevation gain. Riomaggiore is magnificent at sunset. You’ll want to take your time exploring Riomaggiore, the largest of the five Cinque Terre villages. It’s also incredibly beautiful at sunset so stick around and consider having dinner here. I’ve spent several days here on a previous trip when I attended a workshop. We ended each day with cocktails and a sunset vista. Pure magic! Enjoy the last of your sea views before you depart. Depending on when your train is, you can either fit in another short hike, relax by the beach or buy some last minute souvenirs. My train was at 11:00 am so I didn’t have a lot of time after a leisurely sleep in. I felt more rested and peaceful than I had in months. You need a Cinque Terre Card to hike the Cinque Terre trails. There are control booths that will check that you have one. While it’s possible to buy your card there, lines can be long. It’s much faster to buy one in advance at a Tourist Information Centre or online. You have a choice of two tickets. The one-day Cinque Terre Card costs €7.50 and is valid for hiking along the Cinque Terre trails. The other card costs €16 and is a combined hiking/train pass. It gives you unlimited use of the regional trains in second class for the day that runs between La Spezia and Levanto and includes stops at each of the five villages. It’s a good idea to head to the train station and see how much your train ticket will cost before purchasing the pass. Then you can figure out which option is more economical for you. It depends on where you’re staying and if you’re planning on traveling by train after your hike that day. Our tours are available from mid-March to mid-December. I don’t recommend mid-December to mid-March as it can often be rainy. I’d also avoid late June and all of July and August. It’s too hot and crowded. Spring and Fall are ideal. The closest airport to Levanto is Genoa, 76 km away, followed by Pisa, 100 km away. You can also fly into Milan, which is often cheaper. It’s worth checking the different prices on Skyscanner. I book almost all of most of my flights through them. There are frequent trains from Milan, Pisa, and Genova. Check Trainline or Trenitalia, Italy’s main train service for schedules and prices. Genova to Levanto: :51 – 1:36 hours. Cost: €5.90 to €9. A very frequent shuttle service (Volabus) will take you to the railway station in Genoa (€6, 30 minutes’ journey). After this, you’ll take a train to Levanto which takes approximately 1 hour. Pisa to Levanto: 1:17 – 2:20 hours. Cost: €9.90 – €16.10. If you’re looking for a mix of hiking, culture, and food, you’ll enjoy this hiking trip. It’s an excellent option for couples or friends traveling together when one person wants an active vacation while the other wants to hang out and fill up on Italian food. If however, on the other hand, you’re looking for a harder hiking adventure, this likely isn’t for you. In that case, you’d be better off considering hiking in the Dolomites, or hiking the Tour du Mont Blanc. Don’t be fooled though; you’ll still work up a sweat while hiking in the Cinque Terre. In some sections, the steep stone stairs will have your thighs on fire! But you’ll soon forget as you reach the top. 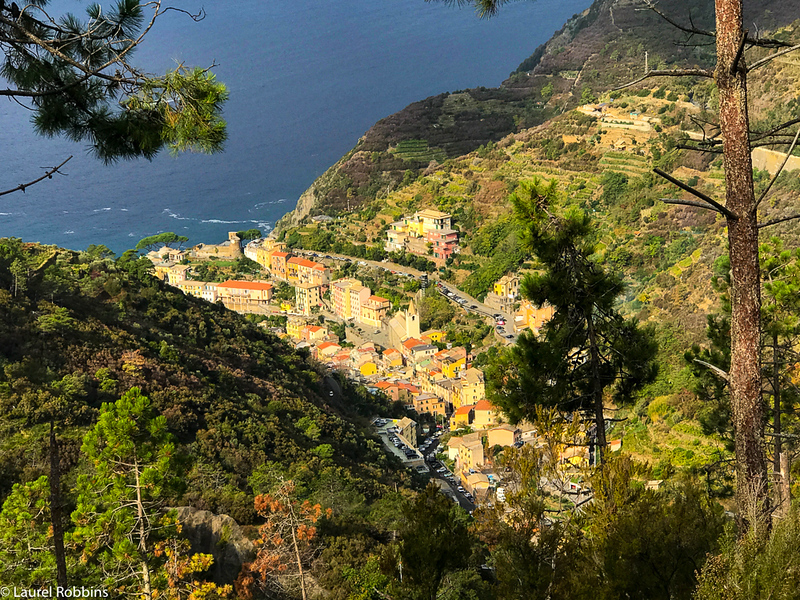 The cool breeze and far-reaching views of Italian villages and coastline make you forget the stairs you climbed – almost. And besides, that means guilt-free gelato! Those colorful houses looks so pretty love the views so serene and beautiful!! @Sophia - Enjoy, it's absolutely stunning. I've been back three times I love it so much. Breathtaking! It looks almost too beautiful to be real. I'm a bit disappointed to have not made it there on my last trip to Italy, I must plan for another! Highly recommend it. It truly is a beautiful place. Oh my God, Laurel! This is such a beautiful city! I would look forward to spending a couple of days here during the summer months! Every photo you posted here is breathtaking as each one is; and I cannot imagine how much more breathtaking seeing the place in person would be. Thank you! This one has been added to my go-to-list.